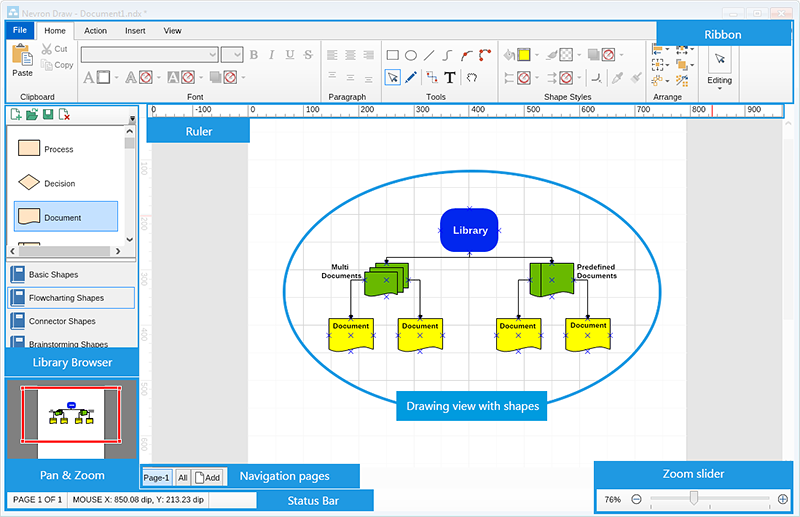 Nevron Draw is an advanced diagram designer which supports many diagramming features and functionality similar to Microsoft Visio®. 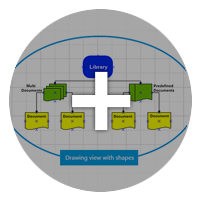 It allows you to create virtually any diagram you can think of, save, print, or export your diagrams as an image or as PDF. Described here you will find just some of the features of Nevron Draw. For more detailed information please refer to the Help Documentation or to the How To section. With Nevron Draw it's easier than ever to arrange your working space - simply choose between the classic command bars (Office 2003 style) and the modern Ribbon command interface. You can easily switch between the two user interfaces based on your preference and enjoy your preferred design environment. Drawing View: this is the area in which you can create your diagrams (the main document area). Library Browser: a section containing all shapes and allowing you to quickly insert them into the drawing view using simple drag and drop. Pan and Zoom View: presents a small preview of the drawing document and can be used to quickly move to another area of the document. Ribbon: contains a set of buttons, menus, combo boxes and other command controls organized logically in groups and tabs that let you manipulate the diagram, add, arrange and style shapes, and so on. Page Navigator: lets you add more pages to your drawing document and switch between them. Zoom Slider: lets you quickly zoom in and out the drawing view. Status Bar: shows useful information about the current selection and the mouse. Nevron Draw comes with a large set of predefined shapes which you can directly drag into your canvas and work with. All predefined shapes are easily modified and you can edit nearly every single aspect of their appearance. As a bonus, you can add your own shapes to a new library or to the predefined ones or even save the simple shapes with the colors of your choice. New libraries can be loaded at any time while working with Nevron Draw. 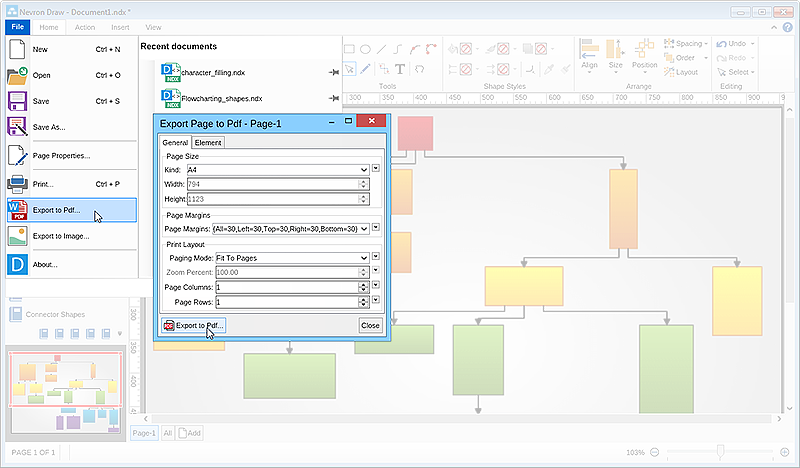 Support for multiple pages: allow you to simultaneously work with as many documents as you need. Large number of predefined shapes: gets you started quick and easy with ready-to-use predefined shapes in several different categories. 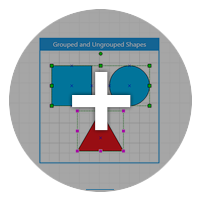 Grouping and ungrouping of shapes: helps you create new shapes quick and easy just by grouping them as needed. 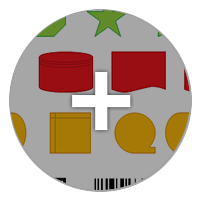 1D and 2D barcodes: allows you to embed over 20 different types of barcodes in your diagrams. Measurement units and scaling: helps you quickly identify the size of your document and change the measurement units when needed. 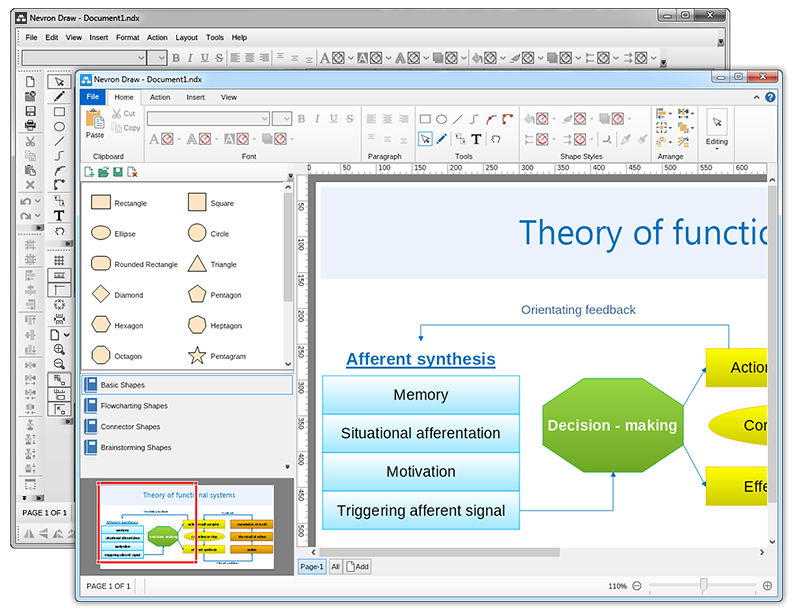 Formulas various formulas and expressions can be used in almost every stage of the diagram creation process, allowing you to create truly advanced, data driven diagrams. 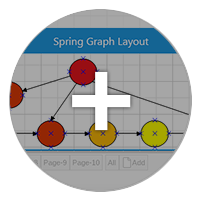 Nevron Draw has a large number of interactivity features, helping you speed up and ease the creation of advanced and complex diagrams. Rotation, scaling and moving of shapes and groups: all shapes and groups of shapes can be easily moved, rotated or resized with Nevron Draw. Complete set of tools: Nevron Draw comes with a lot of tools such as pointer tool, create rectangle tool, create ellipse tool, edit geometry tool, pan tool, etc. Snap and glue: all shapes and connectors in Nevron Draw can be easily snapped to grid or glued to each other. Spacing and positioning of shapes: Nevron Draw's user interface is optimized to help you align, adjust multiple shape's size and distance with just one click. 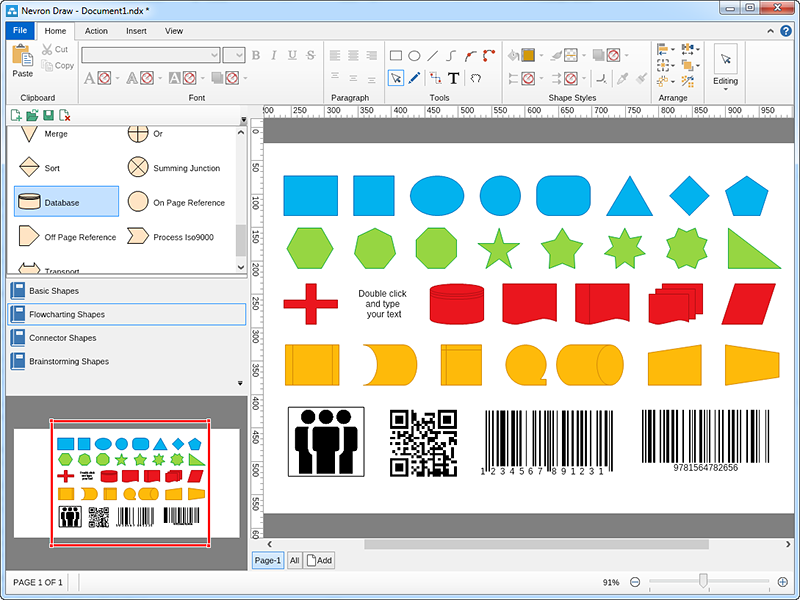 Automatic layouts and routing: 14 automatic layouts with multiple adjustment properties and automatic connector routing which never crosses your shapes are only a fractions of the many features of Nevron Draw. Shape protections: lock any shape or connector from moving, scaling (resizing), or printing. In-place editing and formatting of texts: no annoying pop-up boxes - edit your text right where it will be placed. 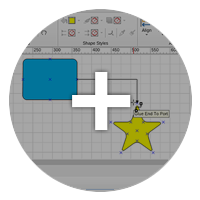 Tooltips: add a tooltip to any shape or connector in your diagrams. 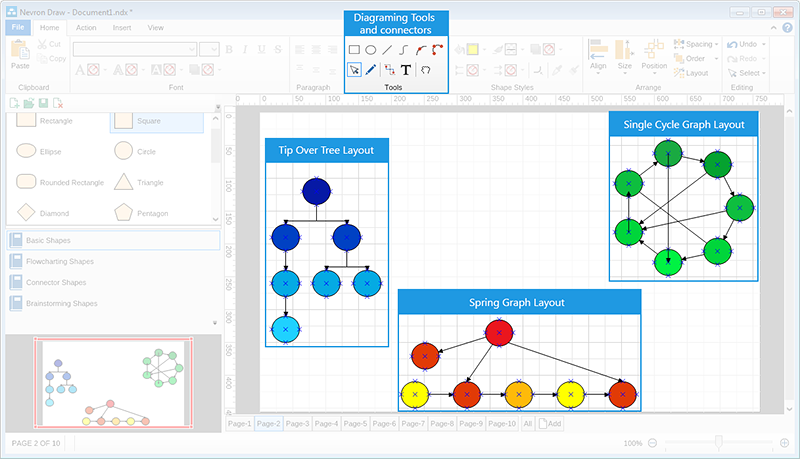 Nevron Draw allows you to easily print your diagrams or save them as either PDF or image files. When exporting to an image file you can select to either export the entire page or only the selected area (shapes) of your diagram. 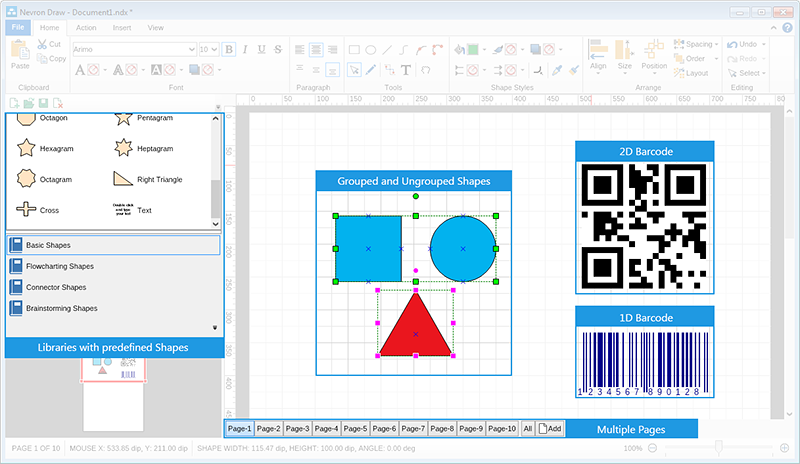 You can set any shape’s properties and forbid a specific shape or group of shapes from printing or exporting and have it only visible while working with the diagram. The image export also allows you to select the resolution of the exported image thus making it easier to export high quality image files. 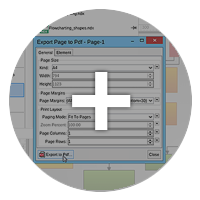 The export to PDF option also offers many options, allowing you to adjust every aspect of the exported diagram page, including page margins and fitting. 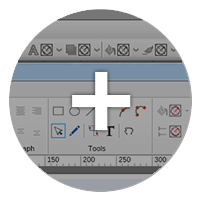 Printing dialog: Nevron Draw's printing dialog allows you to set multiple properties including the page size, margins, layout and more! Excluding shapes from printing: set any shape or connector excluded from printing and it will only be visible in the digital diagram. Saving as PDF: export your diagram as a PDFs. Saving as image: export your diagrams as a PNG, JPEG or BMP images. Saving as Native Nevron XML and binary based formats: save your diagram in any working state and edit it any time after.